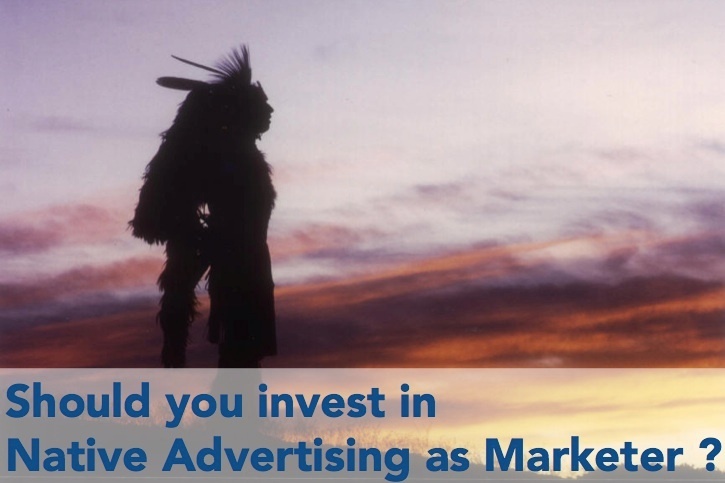 Should you invest in Native Advertising as Marketer ? I’m looking at it and I just don’t quite get it. Banner ads don’t work, and yet marketers still keep investing in it. According to a recent article in Smart Insight click-through rates remain impressively low with “banner blindness” as a key reason for ignoring ads. One day, someone needs to explain me why a marketer doesn’t get fired by the CEO for spending thousands of ad euros and reporting a conversion of 0.2%. But let’s keep that discussion for another time. Native advertising. They are the latest addition to digital advertising land. Named as the “disruptive” technology that will change the advertising business model. It is considered the fresh air that the beleaguered publishers need. Consumers looked at native ads 52% more frequently than banner ads. Native advertisements registered 9% higher lift for brand affinity and 18% higher lift for purchase intent responses. Consumers looked at native ads more than the original editorial content. Some feel as native advertising is the same as advertorials or article marketing. OK. So what is native advertising? And do you need to use it your marketing mix? What is native advertising ? Native ads are ads in the same format than the content on the platform where they are displayed, purchased or sold . Do not only think about the digital world. Print ads in magazines and newspapers are in essence also native ads. They match the media because it is printed. Radio ads also. Just like SMS ads. But street ads are not native ads because they do not fit : it’s print in the street. Advertising on the Web started with display advertising. Banners. That worked for a while, until people went completely blind for that kind of advertising. If you ever clicked on a banner, then it was by accident or out of interest because you are a marketer. The chances you click on a banner are 475 times lower than you are to survive a plane crash. In general, native ads are placed on digital platforms. They are presented ” in-stream“. In-stream means that they are shown along with the real content, always with a clear indication that it’s sponsored content . To me, not all of the above are native ads, but more on that later. The first timid attempts with native advertising by “the big names” obviously attract attention. Not always in a positive way. News sites like Forbes package native ads as content marketing. The point of content marketing is to earn attention, which is something you buy at Forbes. Eventually it is not always clear which interests ultimately play: these of the reader or the commercial interests of the platform. And it is questionable how long it will last these noble intentions versus the commercial interests . Another one I found which I consider doomed to fail. The way the New York Times has done it, and Dell as their first customer, doesn’t give much hope for a lot of efficiency for marketers. Just a big button with Dell on it, and a “catchy ” title. It looks suspiciously a lot like a banner ad. This is not the type of native ads that will bring in customers for marketers. What are the properties of a real native advertisement? Native ads. To me they are a natural extension of the distribution arsenal of content marketers, if used properly. Brands provide relevant information in exchange for brand exposure. That’s doesn’t always mean positive brand exposure. What I mean is that you put useful content in locations that are often visited by your target audience. Because the content is useful for your buyers, they will trust your brand, and will be more inclined to buy from you in the end. Encourages to know more and act. What is real native advertising, and to how make it efficient ? Many consider sponsored (social) updates, advertorials and sponsored search as native advertising. For me personally, genuine native advertising is found on news sites and personal interest sites that have a lot of traffic from your target audience. Promoted tweets, sponsored updates and other forms of promotion only serve to give your content more visibility on social networks and other networks. Real native advertising has no intention of misleading. It has the sincere intention to inform, educate or entertain the buyer. Consumers can “smell” in a split second if something is real or not. Free Sunday morning newspapers or free magazines are full of advertorials where publishers do not even indicate that the content is sponsored content. The effect is that consumers and businesses are becoming increasingly trained on recognizing ‘ fishy’ content. They no longer trust that content. For publishers is clearly about the money, and you can not blame them. They have found a new way to attract advertisers. For marketers on the other hand this will only work when paid content is on the same level as real content that has gone through the hands of journalists and editors. The final verdict : use it or not? I think they absolutely can work, as long as brand go the extra mile to make their content correct, interesting, fun, authentic and meaningful. Let us hope that publishers also play their part in this exercise. Let me know what your experiences are with native advertising. P.S. If you like this blog, please share it.